Axure Share is a hosted service for easily sharing your Axure RP prototypes with others, including your team and clients. It is a free service and allows you to upload up to 1000 projects with RP files up to 400 MB each. 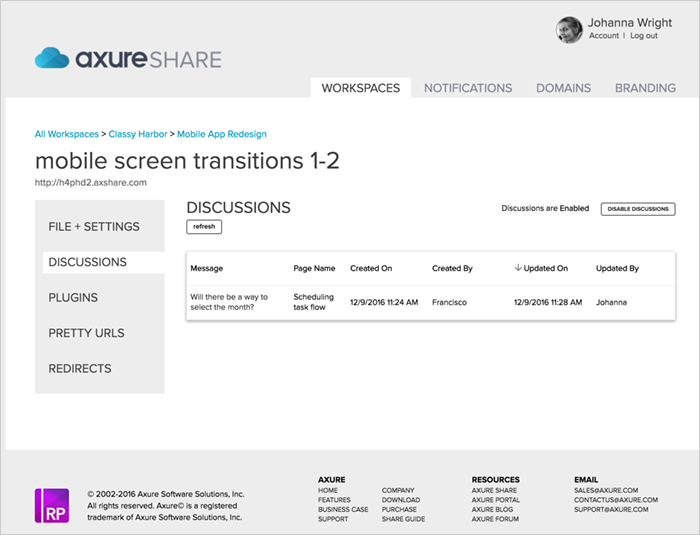 Axure Share includes a Discussion feature for collecting feedback from stakeholders and testers. 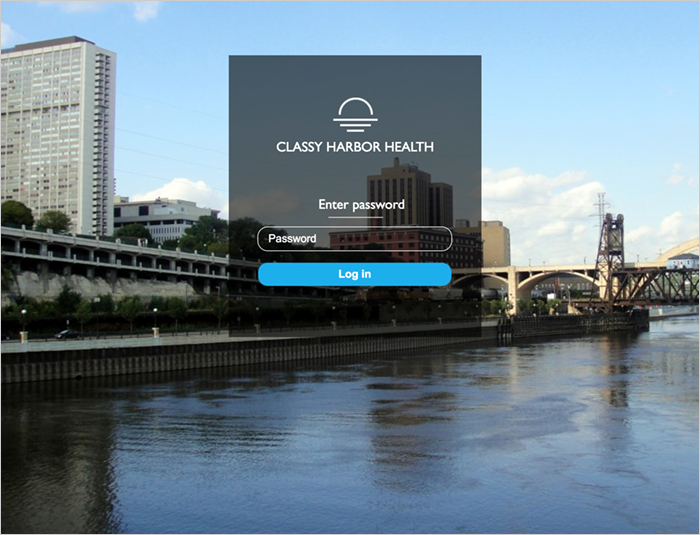 You can also customize the password page for your projects to provide a custom branded experience for your clients. 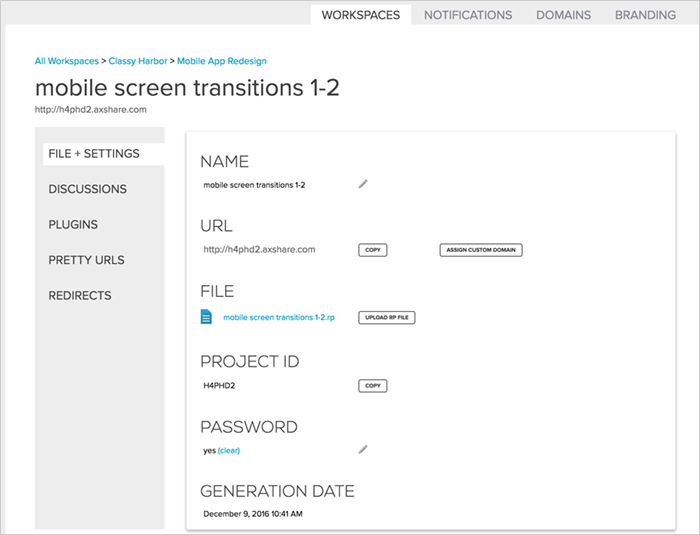 Axure Share projects can be password protected and Workspace settings can be changed to provide additional security. Learn more about Axure Share security in this article. 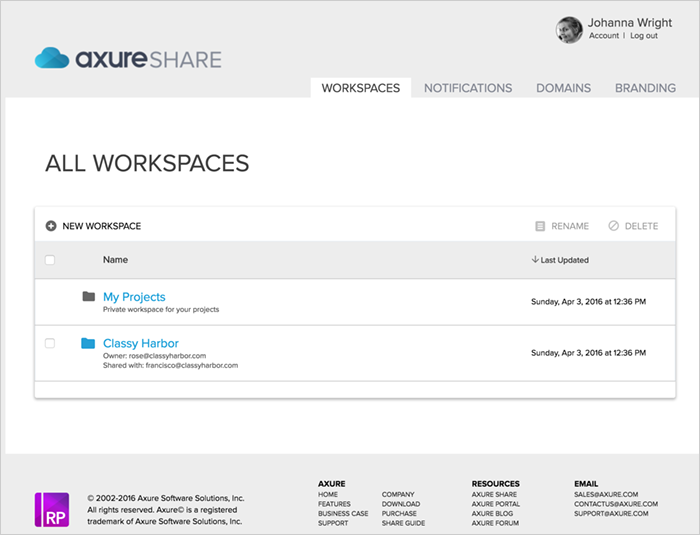 Axure Share projects are organized into workspaces. A workspace can be shared with others, and members of the workspace can publish and manage projects within it. Workspaces also can have custom security settings. Learn more about security settings here. Within a workspace, you can create new projects; create new folders; move, delete and rename projects and folders; and duplicate projects. 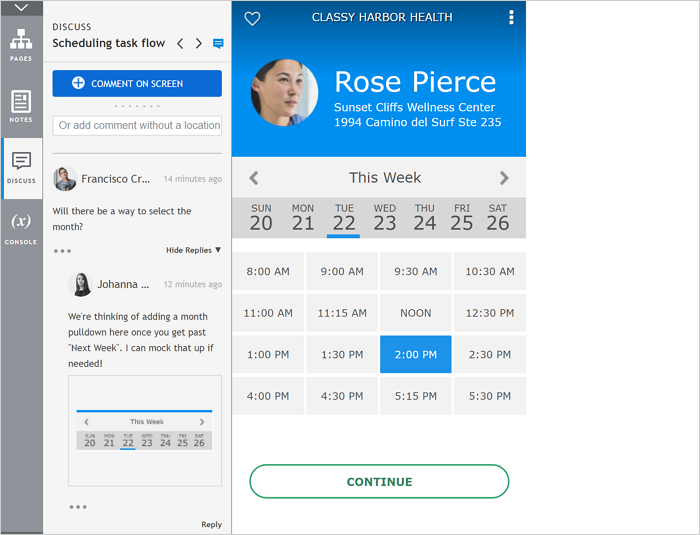 To invite more people to your workspace, open the workspace, and go to Manage Users > Invite People. The recipient will receive an email from Axure notifying them that you would like them to join your workspace. They will be asked to create an account or log in to Axure Share, to accept the invitation. The Owner of a workspace can remove members by clicking Manage Users > Remove User. You can also unjoin a workspace. If you are the owner, you will need to select a new owner when you leave the workspace. The "My Projects" workspace is a personal workspace that cannot be shared. This is the default workspace for projects uploaded from Axure RP. You can move a project from "My Projects" to another workspace if you'd like to be able to share access to it. 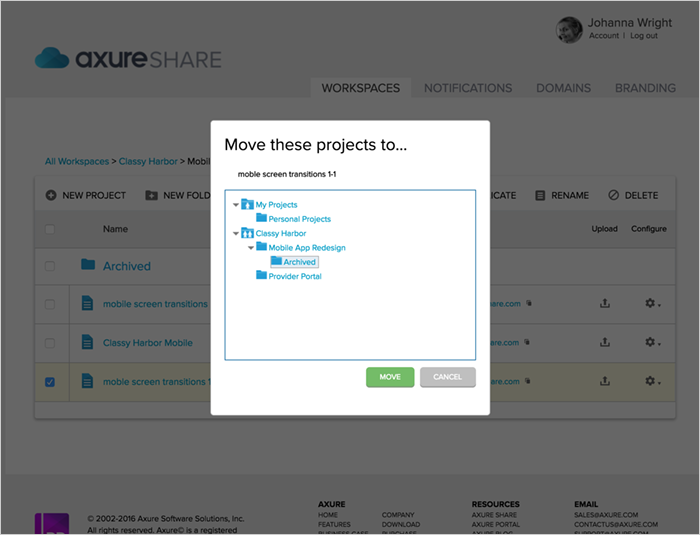 To create a new project in Axure Share, navigate to the workspace where you want to create it; then click the New Project button. Name the project and optionally upload an RP file and set a password. You can add folders to organize your projects by clicking the New Folder button. Move: Click the checkbox next to the project or folder to be moved, click the Move button, select where to move it to, then click Move. Delete: Click the checkbox next to the project or folder to be deleted, click the Delete button, then click Delete. Rename: Click the checkbox next to the project or folder to be renamed, click the Rename button, type in the new name, then click Rename. Duplicate: Click the checkbox next to the project to be duplicated, click the Duplicate button, then click Duplicate. Use the menu of the "Configure" gear icon at the far right of the list of projects to access the prototype's configuration and settings. Use the first menu option, "File + Settings", to rename the project, upload or download an RP file, and change the project password. You can navigate from this page to the following pages: Discussions, History (for Team Projects only) Plugins, Pretty URLs, and Redirects. Learn more about these features below. 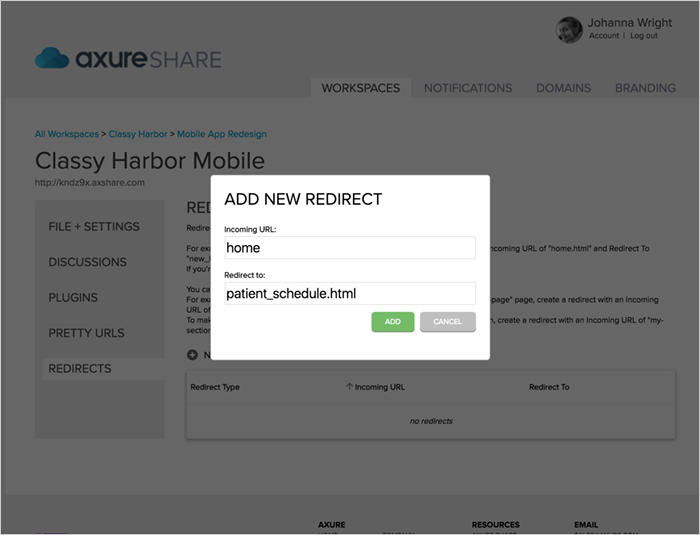 To publish to Axure Share from Axure RP, click on the "Share" button in the Publish toolbar. You can also press [F6] on PC or [SHIFT] + [CMD] + [A] on Mac. If you need to create an account, you can do that in the Publish to Axure Share dialog. Otherwise, enter your account's email and password. Enter a project name and--if you want to keep it private--enter a password. You can also select the workspace and folder for the project. By default, projects will be published to your "My Projects" workspace. 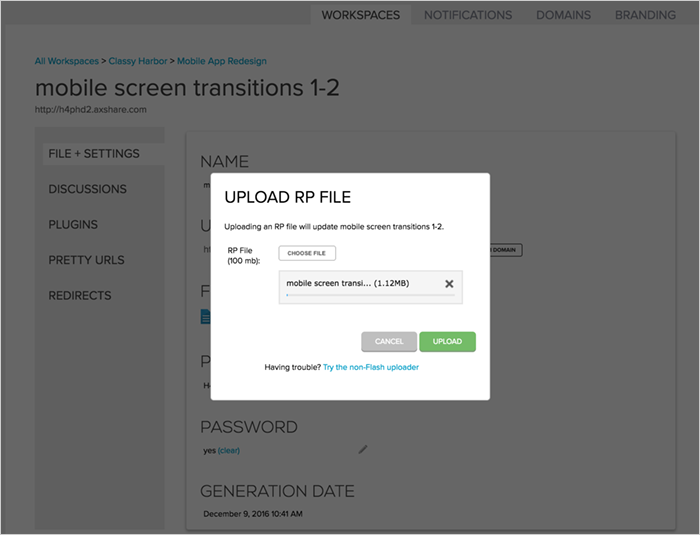 When the RP file is uploaded, an URL to the generated project is provided. 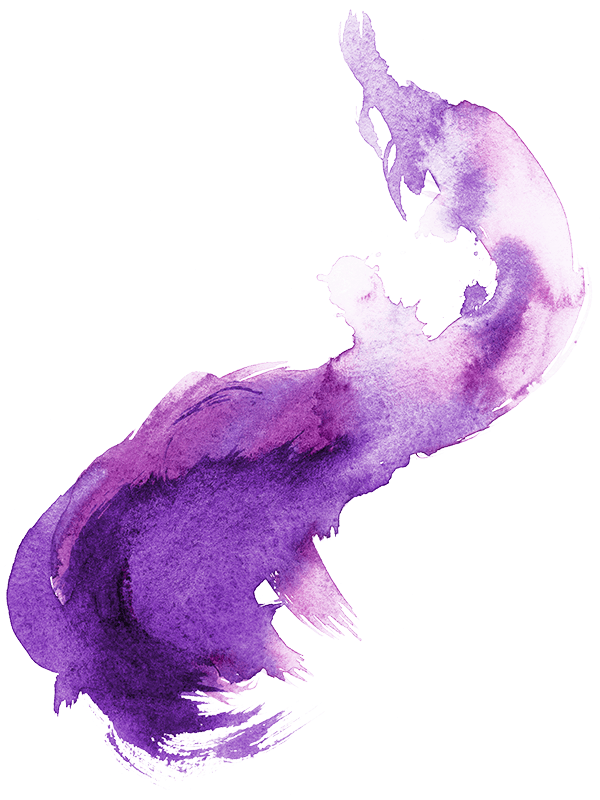 Click it to view the prototype or copy it to send to others. 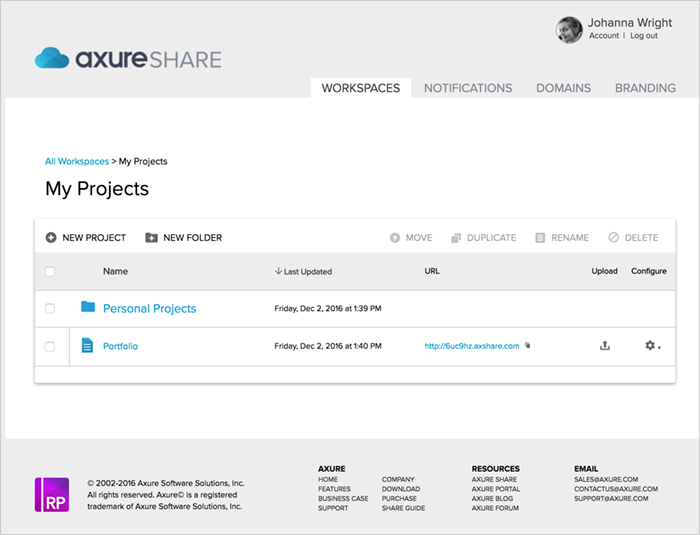 After logging in at share.axure.com, you can select a workspace and click "New Project" to publish an RP file to a new project. If you have an existing project that you'd like to update, click the "upload" icon from the project listing or click "Upload RP File" from the File + Settings page. Click on the project's name or URL to view the prototype. In the Pages tab of the sidebar, click the Get Links icon (second from the right) to get the link for that page, with or without the sidebar. Copy the link to share the prototype with others. In general, links that show the sidebar look like <http://######.axshare.com/#p=pagename> and links for pages without the sidebar look like <http://######.axshare.com/pagename.html>. Links with the sidebar hidden look like <http://####.axshare.com/#p=pagename&c=1>. You can turn the sidebar on and off by changing the link. 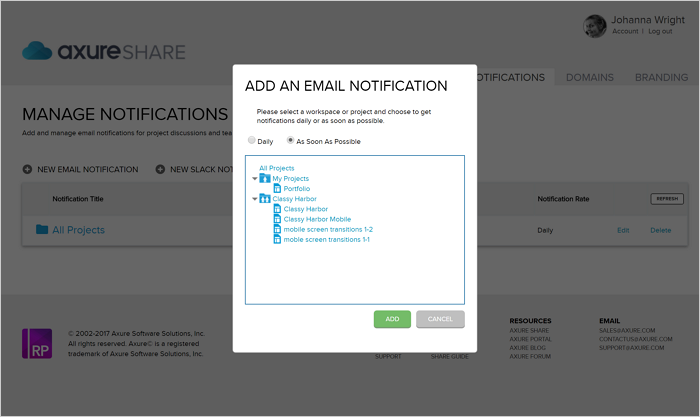 Set up notifications to get alerts when new comments or replies are added to project discussions, when comments are resolved or unresolved, and when edits are checked in to Axure Share–hosted team projects. Notifications can be sent as soon as activity is registered or in a daily digest. 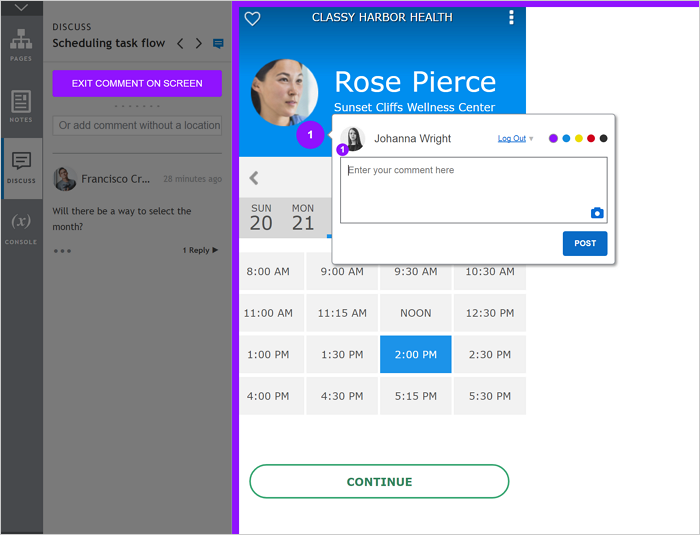 You can receive notifications via email, Slack, or Microsoft Teams. Click "Notifications" in the main menu to view your discussion notification settings. Click "New Email Notification" to add a subscription. 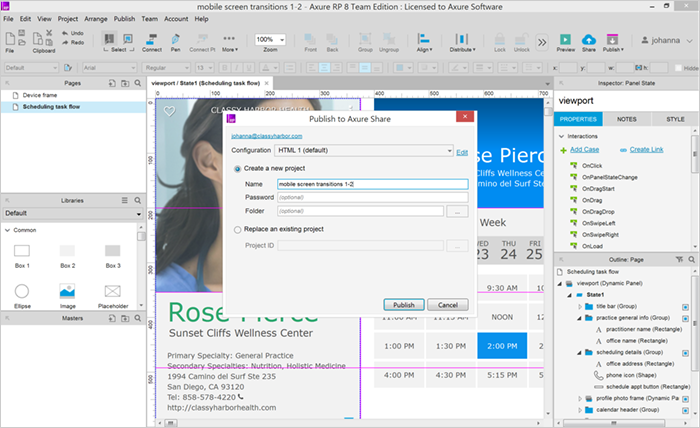 You can choose to subscribe to "All Projects", a specific workspace, or a specific project. 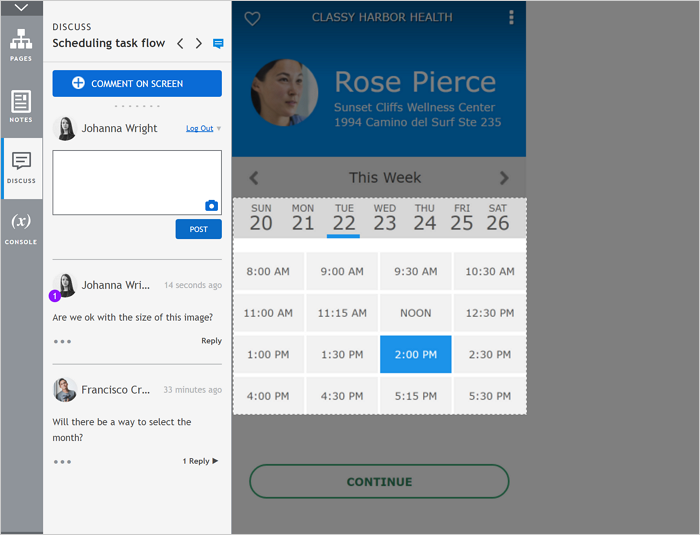 You can also choose to get an email as soon as possible or in a daily digest. To add a plugin, select Plugins from the gear icon menu to go to a project's Plugins page. Then click New Plugin. Give the plugin a name, priority, assign the location (end of the head, end of the body, or inside dynamic panels with name), add the code and click the Save and Continue button. Next, select the pages to which you want to add the plugin. You can always return later to make changes. 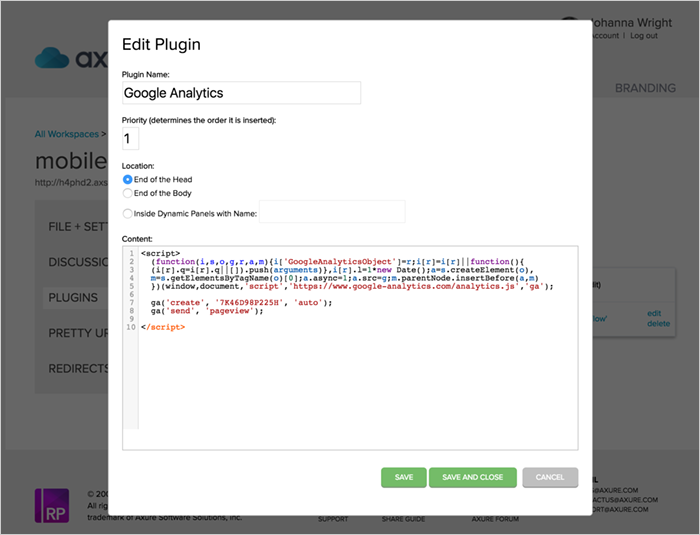 Some example plugins to put at the end of the head include: Google Analytics, Kissmetrics, Mixpanel, BugHerd, and any code required for user testing tools. Examples for the end of the body include: Adwords retargeting tag and scripts to run other plugins. Examples for inside dynamic panels include: PayPal buttons, Facebook buttons, Twitter buttons, and HTML. Pretty URLs are used to set a default page for the project that displays when opening the URL, and the default page for a 404 error. 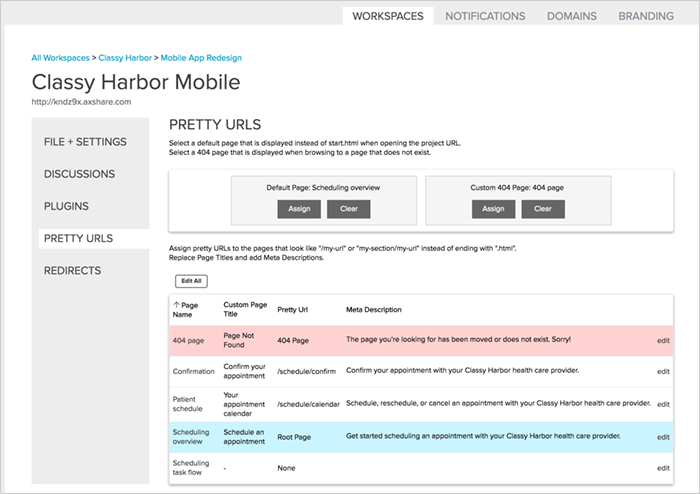 The Pretty URLs tab is also used to set custom page titles, pretty URLs, and meta description properties. You can select a root page which will open without a .html page name, as well as without a sidebar, when opening the project URL. To set this up, click the Assign button. The Assign Default Page dialog opens with the page names from your project in the dropdown list. Select the page for the default from the list and click the Set as Default button. If you later wish to choose a different page to set as the default, click the Clear button and assign a new page. To get the sidebar to show, add /start.html#p= or /index.html#p= to the end of the URL. The custom 404 page will display if a user reaches a URL that is not in your sitemap. Assign a custom 404 page by clicking the Assign button, selecting the page from the dropdown list and clicking the Set as 404 button. If you later wish to choose a different page to set as the 404 page, click the Clear button and assign a new page. One page or multiple pages can be edited at a time. Click edit at the end of the page name line to edit just that page. Click Edit All at the top of the page listing to edit all or multiple pages. When you are done editing, click save. Custom Page Title: Type in your custom page title. For SEO purposes, we suggest using keywords at the beginning of the page title and your business name at the end. Pretty URL: Type in the URL, include the folder structure as appropriate. Meta Description: Type in the meta description. Keep in mind this is the text description that shows in search results. This should be a summary of what the page is about. Make sure to include relevant keywords. Redirects can be used to point old page URLs to new ones. For example, to make "home" go to "new-home", create a redirect with an Incoming URL of "home" and Redirect To "new-home". If you're not using pretty URLs, you can make "home.html" go to "new-home.html" similarly. You can also make an entire path redirect to one page. 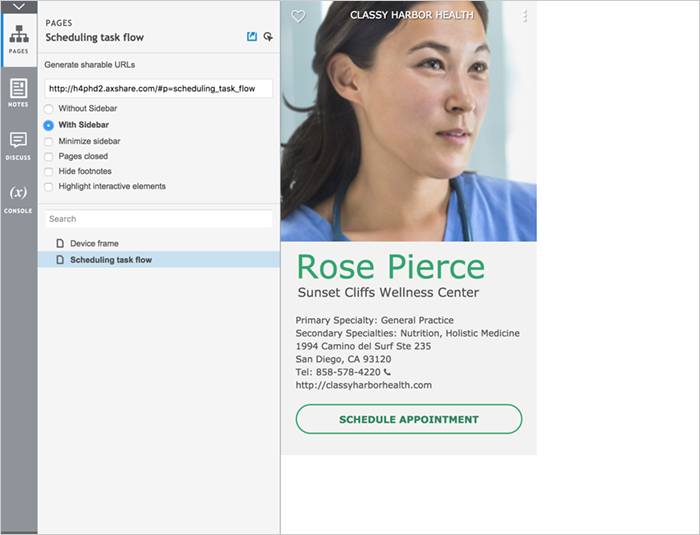 For example, to make any page within the "my-section/" path redirect to the "my-new-section" page, create a redirect with an Incoming URL of "my-section/*" and Redirect To "my-new-section". Click the New Redirect button to open the Add New Redirect dialog. Incoming URL: Type in the incoming URL you want to redirect. Redirect To: Type in the URL to redirect to. Click the Add button and it will be added to the redirects listing. To give your clients a branded experience that they are comfortable with, you can customize the password page for your projects. To customize your password page, download the template AxSharePrototypePasswordPage_v8.rp file. Open the template file and make your changes. Add new widgets, style the form or change the page background. Feel free to make changes, but avoid deleting template widgets with labels or changing the labels. Once you have saved your file, upload it by clicking the Upload button on the branding page to publish it. 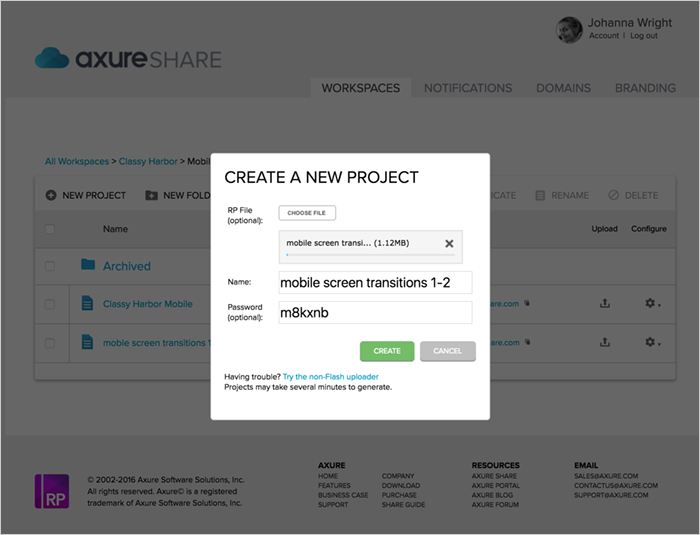 If the project you wish to create and host on Axure Share is a team project, learn how to do so in this reference guide. Learn how to set up Slack and Microsoft Teams notifications at the links below. Discussions enable viewers to create and reply to comments within the prototype. 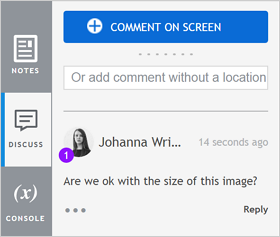 Comments can be added to each individual page and are available to anyone with access to the prototype. 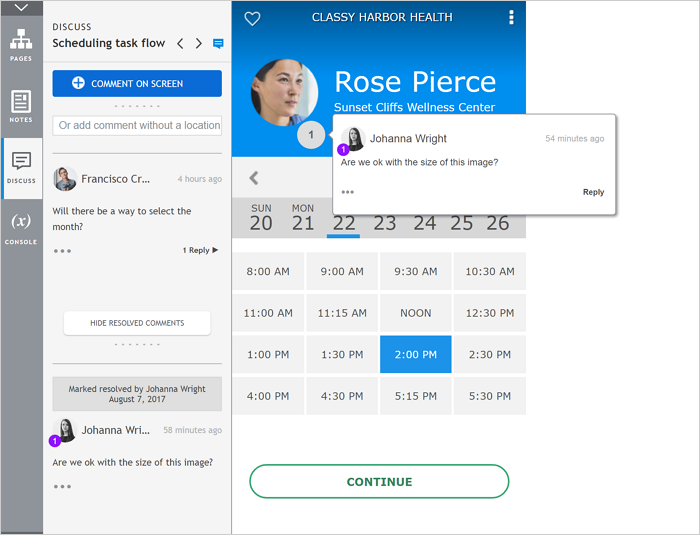 Members of the workspace containing the project can choose to receive email, Slack, or Microsoft Teams notifications when comments are added, resolved, and unresolved. Navigate to the prototype in your web browser and click on the Discuss tab of the sidebar to view the page's existing discussion threads. Enter your new comment in the text field at the top of the tab and click "Post" to add it to the thread list below. To reply to an existing comment, click "Reply" at the bottom-right of the comment in the thread list. Discussions can also be viewed and edited on the Discussions page of a project. 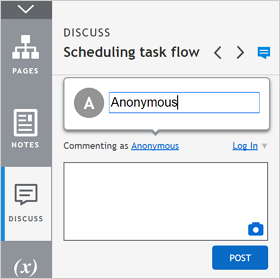 From the project list in a workspace, hover over the gear icon to the right of a project and then click "Discussions" in the menu. The discussion comments for the project are listed, including when and by whom the comment and the last reply were created. Click the comment description to see all the replies for that comment. You also have the option to edit, delete, (un)resolve, or add a comment or reply here. You can also disable discussions from this page by clicking the "Disable Discussions" button. You can also enter comments directly on the prototype page. To do this, click the "Comment on Screen" button at the top of the Discuss tab. Then, click anywhere inside the purple box to drop a pin for your comment. Optionally select a color for the pin at the top-right of the comment bubble that appears, type a comment in the text field, and click "Post". You can view your on-screen comment by clicking its pin on the page. On-screen comments are also added to the thread list in the sidebar, so you can view your comment there as well. In the sidebar, on-screen comments are accompanied by a small pin icon; you can click the icon to scroll the page to the pin's location and open the comment. When you're done adding on-screen comments, click the "Exit Comment on Screen" button in the sidebar or the "X" icon at the top-right corner of the page. You can also press the [Esc] key on your keyboard. Screenshots can be captured when using Google Chrome and require a browser plugin (link below). While adding a comment or reply, you can click the camera icon to capture a screenshot. You can also use the keyboard shortcut [CTRL] + [SHIFT] +  on PC or [CMD] + [SHIFT] +  on Mac. Click and drag your mouse to select the area for the screenshot. It will be saved with your comment when you click "submit". Clicking the screenshot thumbnail in the discussions opens a full-sized version. 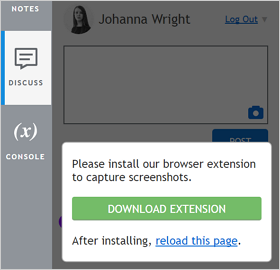 Screenshots can be viewed in any browser, but to add a screenshot, you'll need to use Google Chrome with a browser extension. When you click the camera icon, you'll be prompted to install the plugin if it's not already installed. When commenting, you can log in to your Axure Share account (if you aren't already) via the "Log In" link at the top-right of a comment box. If you comment while logged in, your email address and profile picture will appear above your comments. 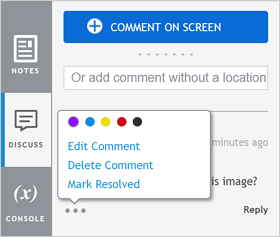 Click the "More Options" menu at the bottom-left of a discussion comment to edit its text and screenshots, change its pin color (if applicable), delete it, or mark it as resolved. Deleting a comment removes it and its replies from the prototype entirely. You cannot recover deleted comments, so only use this option if you're sure that the comment is no longer needed. Resolving a comment hides it but does not delete it. You can view resolved comments at any time by clicking the "Show Resolved Comments" button at the bottom of the discussion thread list in the sidebar. This will show the comments in a separate thread list below the button. On-screen pins for those comments, if any, will also be shown, and they will be colored grey to distinguish them from pins for unresolved comments. If you need to unresolve a comment, you can do so by clicking the "More Options" menu and selecting "Mark Unresolved". Tip: If you upload a file and are missing some pages, go to "Publish > Generate HTML Files" in Axure RP, select "Pages" in the left column of the dialog, and make sure the checkboxes next to those pages are checked. Note: If you've registered your name on the Edit Profile tab of the Axure customer portal, your name will be displayed instead of your email address. Otherwise, if you don't have an Axure Share account or do not wish to log in, you can continue commenting as "Anonymous". You can also comment under a different name by clicking the word "Anonymous" above the text field and entering a new name.